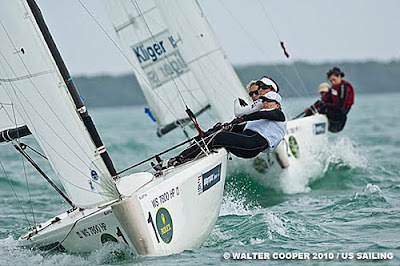 January 25, 2010 - Miami, FL - We started racing around 10:15 this morning at the US Sailing Rolex Miami OCR. The cold front that was scheduled to blow through in the early afternoon was looming on the other side of the bay. And so, because it was moving in a more northerly direction than easterly, we sailed along the edge of the dark clouds and completed our scheduled three races for the day. It was a great day for us, and we were very happy with how things turned out. We started the round 3-0 and will race another four races to complete our round tomorrow afternoon. 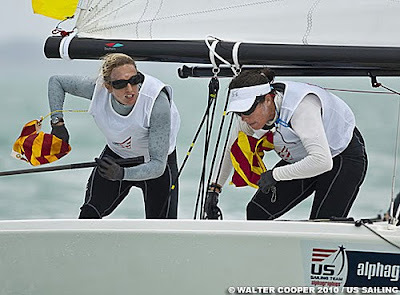 Our races were held in 15-17kts and a short chop. Because we were sailing along the edge of the storm clouds, the shifts were quite frequent, but Molly and Debbie did a great job of putting us in the correct place relative to our competitor to make a gain out of it. Our pre-starts were quite quick and aggressive, and were a great indicator of how our work on boat handling has been going. We are very happy with where we are at, but are now at the point of nit-picking little things to make it even more smooth. We had one exciting pre-start with the Israeli team. We were trailing them back towards the start line with too much time left for them to start cleanly if they kept going. With about 40 seconds left, we hooked them to leeward and forced them to tack. This was a bit of a mistake on our part because we did it too close to the committee boat so that if we wanted to tack with them, we would get ourselves pinned between them and the committee boat, resulting in us not being able to start. We didn't tack because we realized this, and instead gybed around at them, to try and catch them before they got a gybe in. Well, they managed to get their gybe in to starboard, and although we were trying to avoid them, I chose the wrong direction to avoid them, thus putting ourselves across their path. This was a big mistake by me, and resulted in us getting a penalty. But, we cleared our heads, gybed around behind them and hooked them to leeward and drew a penalty right back on them 10 seconds after the start to even the penalties out. We engaged them in a tacking dual upwind, and managed to get control of the right and passed them about half way up the beat. From there, we just had to sail smart and stay out of trouble, which we did and went on to win the race. We are very happy with how our day went. We have done loads of practice over the last couple of weeks, working on improving our communication and our plays. Today, save my one big mistake, was a great day for our team. Everything went quite smoothly. We are looking forward to racing again tomorrow and finishing up the round robin. You can check out the results for the regatta here. We would like to thank our sponsors, Carmeuse and USSTAG, for their continued support towards our campaign for the 2012 Olympics, and we look forward to being able to name other sponsors in our future daily reports.